Do you keep a sketchbook? 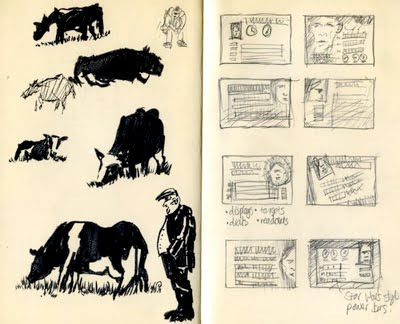 For generations artists and designers of all disciplines have kept sketchbooks as part of the their working practice and in this day and age of high technology the sketchbook is still arguably more important than any other tool an artist has at their disposal, apart from perhaps a pencil. This isn't some form of Ludditism or Stuckist technological backlash or an attempt to appear cool but the fact that the act of drawing is an essential part of the creative process and it's best performed using pencil and paper rather than computers. Dump the Wacom and pick up a 4B instead. Old sketchbooks, dating back to around 15 years ago up to one finished in May. 1) Idea repository. A sketchbook is a place where you can note down ideas not just for referring back to in a day or two but also in a month or two, a year or two and even a decade or two. A sketchbook records visual ideas and moods in the same way a journal records thoughts in prose and over the years these books become a valuable resource for referring back to. As a graphic designer I often refer to old sketchbooks when rooting for inspiration and these books have become a vital record of ideas that I had when I was in a different time with different influences and a different zeitgeist. 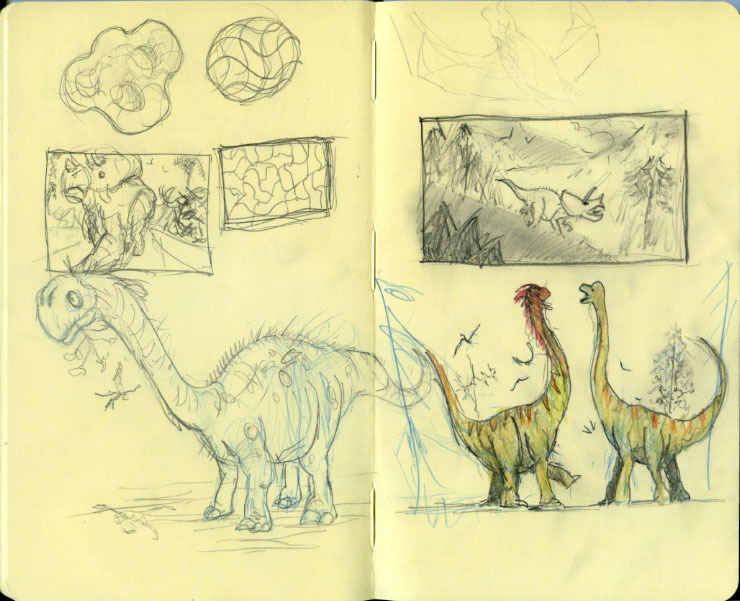 Ideas... from singing brachiosaurs, a sheepish looking cartoony sauropod, Triceratops picture compositions and a small blobby thing that lives somewhere in all our bodies. 2) Trying things out. Undoubtedly one of the main use of sketchbooks is to get as many ideas down on paper as possible when brainstorming new projects. As I said above, this is far more efficiently achieved using a pencil and paper than by working up ideas on a computer. 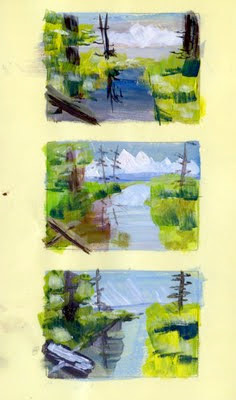 The organic, free-flowing nature of sketching in it's roughest form enables concepts to be worked out quickly and thoroughly before being transferred to the canvas or computer for working up. I test out colour schemes, compositions and tonal schemes in my sketchbooks, I work out the forms of everything from dinosaurs, cartoon characters and organelles so when I start working on the computer it's all there, organised and thought-out. Compositional studies of Yellowstone Lake, sketched from a photo my wife took whilst we were backcountry hiking for a morning there last year. 3) Sticking things in. 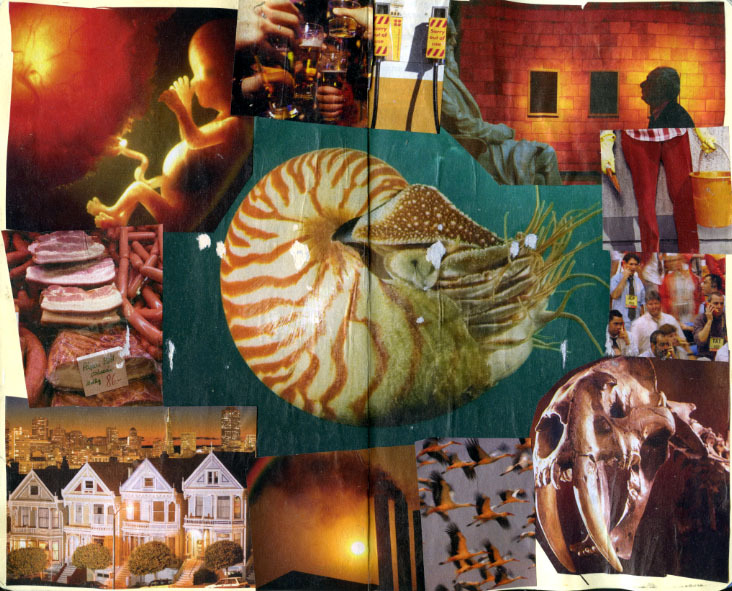 I stick all sorts of things in my sketchbooks, from old photos found in the pages of charity-shop books to collages of magazine clippings that I am using as small personal moodboards. I will paint over some of them with gouache, deconstruct some with pen and ink and include such oddments of daily life as bus tickets, magazine book/film/music reviews, flag day stickers and those wonderful little coloured labels you find on fruit. All this eventually builds into a rich and highly eclectic mix of visual clutter that is rewarding to browse through when a quiet moment presents itself. For example, after writing this post I'll be cutting out and sticking in my current sketchbook the picture of Paul McCartney and George Harrison that came with todays Guardian. A collage of magazine clippings that I collected whilst thinking about an orange colour scheme. The variety of image is intentional so I don't get distracted and end up wandering down one conceptual route only. On left, cows in the field near our house drawn from life (plus a farmer, not the one who owns these cows and not drawn from life). On the right, initial screen designs for a motion graphics project. Note sci-fi influences. 5) Portability and convenience. Yes you could use you iPad, your laptop etc but I suspect that if you do in the back of your mind is the nagging suspicion that it's not as satisfying an experience as using pencil/pen/paint/mud etc on paper, and you'd be right. Your sketchbook will never run out of batteries, if you drop it doesn't break and it won't become obsolete when the next new sketchbook comes out. It won't be a target for thieves (unless you're David Hockney or someone) and you can chuck in a bag and forget about it until the moment inspiration strikes or you want to doodle. 6) Other artist's sketchbooks. In recent years several books have been published that show the contents of other artist's sketchbooks and these can be fascinating and highly inspirational. For instance, my personal favourites are Street Sketchbook, which features the work of sixty artists and Architects' Sketchbooks, which contains the work of various architects. Both of these are books which give some insight into the creative process and how different artists approach their work in terms of idea generation and concept refinement. Also, check out the work of fine artists if you can; I'm an admirer of the work of Francis Bacon and his sketchbooks and collections of pictures give a fascinating insight into the mind of this still controversial artist. I'm sure many of you reading this will keep sketchbooks already, and if you don't then give it a try as it's cheap and once you've started drawing in it utterly invaluable. I wouldn't recommend this just for artists and designers either, I believe everyone can benefit from carrying a sketchbook with them in the field, have one on the desk or next to the TV or when doing research. As palaeontologists we get to see some pretty inspiring sights, so make visual notes of them in a sketchbook (although a field notebook also can be used for this purpose of course). Drawing ability doesn't matter either, as this is your private book and not for public show, though draw enough and you will improve. We are visual animals and the pleasure and usefulness of keeping a sketchbook will repay the work put in for years to come. Excellent! To me ,the pencil is a surrogate for your sense of touch . It is like running your hands over what you see , in my opinion . Much better than a keyboard I would imagine . Dinosaurs and Moleskines? what can go wrong?? Thank you for a brilliant post. You're so right. A few years ago I decided to start sketching more instead of focusing most of my art on serious drawings and treating sketching only as a stage. I can't believe how much my drawing improved. I was pretty good when I started, but what I do now makes my first sketchbooks look like a kid did them. I am working on building up my paleo-art skills currently and dared to choose "Prehistoric" as my theme for the 2012 Sketchbook Project by the Art House Collective. http://www.arthousecoop.com/projects/sketchbookproject has been going for some years now. For a fee, they send you a sketchbook. You do what you want in it, mail your sketchbook back to them and it goes on tour and becomes part of a permanent exhibit. Every year as you sign in, there's a drop-down list of themes available. This year, I saw "Prehistoric" and my jaw dropped. Okay, this is it, this is the year I learn to sketch saber tooth cats, mastodons and archosauria. I was going to theme it all on working on my Pleistocene setting novel, but reading this - hey, why not treat it as a sketchbook and just fill it with studies of anything that "Prehistoric" brings to mind.